Morakniv Wood Carving Hook Knife No. 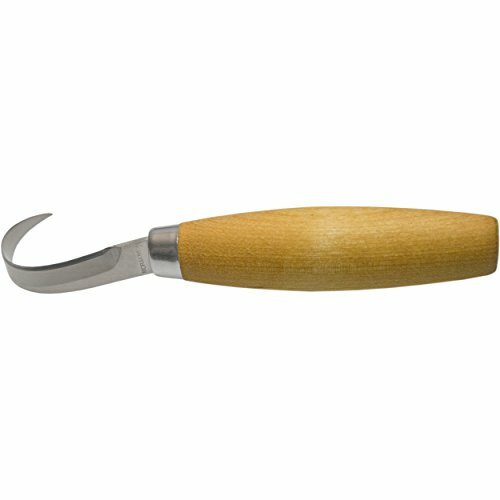 164 is a versatile and ideal carving tool for wood workers creating spoons, bowls, cups, or any detailed relief carving by hand. It features a single-edged blade suitable for pull cuts using one hand and push cuts using the other. The Sandvik 12C27 stainless steel blade features exceptional edge performance, razor sharpness, and is highly resistant to corrosion. For superior strength and robustness, the tang of the Morakniv Wood Carving Hook Knife extends completely through the handle. The ergonomically designed oiled birch wood handle sits comfortably in the hand, providing control, safety, and balance. Generations of carpenters and wood carvers have appreciated the precision tools made by Morakniv in Mora, Sweden since 1891. Today, professionals worldwide trust the quality materials and fine craftsmanship that go into the making of Morkniv knives. Total length 6.3 inches (160 mm); blade length 2.0 inches (50 mm); blade thickness 0.1 inches (2.5 mm); weight: 2.1 oz. (59 g). Made in Sweden. Limited lifetime manufacturer’s warranty.